As title says. Just want to know if it was good-decent-bad. I read the guide about selective summoning and since i got a decent 5stars but no 4’s i dont know if continue rolling or keep it safe. Yes, i have another 29 rerolls so i think i shoud continue, but wanted to ask first. I would rate this selective summon a 5/10. 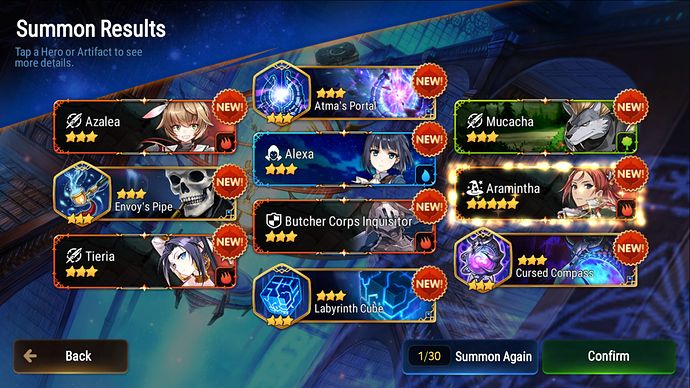 Aramintha is a good mage and DPS with a good ATK buff, but you drew neither 4* heroes nor artifacts. And while Aramintha is a good unit, she’s not the best farmer, either. People will recommend that you pull for Angelica/Achates and a 5* farmer like Vildred or Sez, though you could get any combination of Angelica and any 5* (within reason) and still be quite happy. Bad, Best case scenario is angelica and a five star or Tamarrine and a good 4 star, worse but ok is angelica or tamarrine by themselves, you might be a bit slower earlier but later on you will be much better off, these 2 healers can let you do content earlier than your team should be able to do if you had another healer, one of the best dps(lorina) in the game is basically free so dps isnt a problem.